As Australia’s most populated region, it’s little surprise that Sydney has perhaps the most comprehensive National Broadband Network (NBN) coverage in the country. The city, from the coast to the CBD and its surrounding suburbs, is full of hundreds of sites in various states of preparation, construction and completion. The best way to find out if your exact location is connected to the NBN is to check the NBN Coverage Checker. For more information about what the NBN is capable of, read iiNet’s FAQ page. Most major neighbourhoods in and around the CBD either already have NBN access or have sites that are in the process of being built. This includes locations like Alexandria, Surry Hills, Eveleigh, Newtown and Moore Park. Spreading out from there, sites are dotted around Balmain, Rozelle, Marrickville and the airport. Back in October 2014, much of the NBN work that had been completed was located inland to the west and northwest of the CBD. The progress has spread in varying degrees in nearly all directions. In the Inner West, sites in Campsie that were being planned in October 2014 are now under construction. The same goes for Auburn, though many users in that area are already able to take advantage of the NBN’s super fast speeds. There is a blanket of connection covering Homebush, Rookwood, and Lidcombe. To the southwest of that are a few pockets of NBN sites in differing stages of completion. Another bigger spread of connection is located around Campbelltown, where the NBN is already working. Surrounding it is a collection of sites prepared for build that covers Rosemeadow, Ambarvale, Ruse, Kentlyn and Leumeah. Shifting back inland to the northwest of the CBD, there are four main clusters of NBN sites. One spreads from Eastern Creek around to Seven Hills, up toward Kings Park and Marayong and jutting out toward Doonside before travelling down to Arndell Park. North of that, a large area loosely bordered by Colebee, Stanhope Gardens, Beaumont Hills, the area southwest of Annangrove, Rouse Hill, Box Hill, the area stretching up toward Scheyville National Park and back down to Marsden Park is largely connected to the NBN or has sites prepared. The other two bigger collections of sites are to the west. One sits in the rough ring created by Berkshire Park, Windsor, Richmond and Londonderry. The other is south of that and features Cranebrook, Cambridge Gardens, Cambridge Park, Werrington County, Penrith and Kingswood. Sydney’s NBN coverage is wide and varied. If your area is not yet connected, register your interest on the NBN Wait List so you know when you can start enjoying the NBN. While you wait, learn more about iiNet’s NBN plans. The NBN (National Broadband Network) is set to deliver download speeds that are up to four times quicker than the fastest currently available on ADSL2+ plus greater reliability. Rollout of the network is progressing across the country, including a range of suburbs around Sydney where the network is either already available or work has commenced to make the network available soon. Where in Sydney is NBN coverage already available or coming soon? On the NBN map of Sydney, you’ll see there are small pockets in and around the Sydney CBD where the rollout has started. However the NBN Sydney rollout to date has provided the most coverage to suburbs in the West and North West. In the Inner West, parts of Strathfield, Berala and Rookwood already have NBN availability while in parts of Campsie, Belfield and Auburn preparation is underway and the NBN will be available soon. Looking further out, construction of the NBN has started in and around the suburbs of Marsden Park, Blacktown and Liverpool – some addresses in these areas already have coverage available! While the suburbs we’ve mentioned have the most widespread current and planned NBN coverage, there are smaller pockets all over Sydney where the rollout of the network has started. 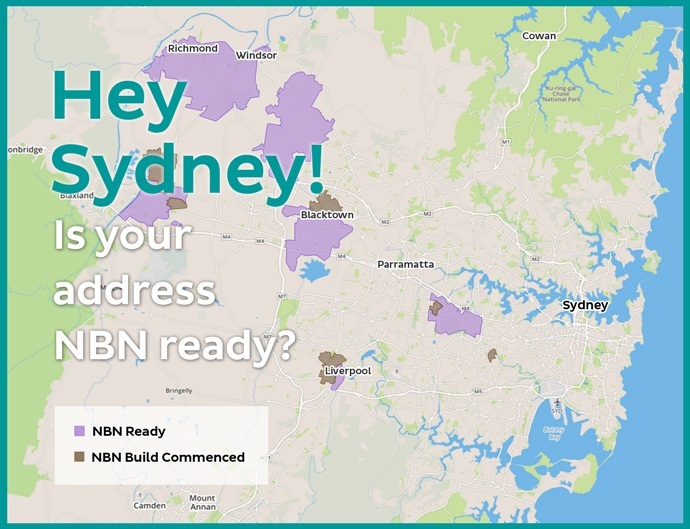 You can check the status of the NBN Sydney coverage specifically at your address by entering your details into the NBN rollout map on our coverage page. Construction of the NBN across Australia is being managed by NBN Co on behalf of the Federal Government. However, customers will need to sign up with a Retail Service Provider (RSP) like iiNet who will provide NBN services to your household. New areas are added to the rollout frequently, and from the time that construction of the network commences in an area it generally takes about 12 months for the network to be available. We can keep you up to date when the NBN rollout to Sydney reaches your address – just register your interest here and we’ll keep you up to date with the latest NBN news including when it’s coming to your area. To connect to the NBN when it becomes available at your address, head to our plans page to find the perfect plan for your household and take advantage of the faster, more reliable internet the NBN offers.